NEW YORK — Senator Charles Schumer is seeking to make it illegal for anyone to distribute or record the revealing images produced by full-body scanners at airports. The New York Democrat introduced a bill yesterday that would set penalties of up to a year in prison and fines up to $100,000, or both. “Anyone who would try to use these images for purposes other than security should be severely punished,’’ Schumer said. The machines can peer through people’s clothing, but the Transportation Security Administration said the images cannot be stored, transmitted, or printed and are deleted after being reviewed. The images are blurred to mask the identity of the person. Passengers can opt instead for a new pat-down search that includes the crotch and chest. But privacy advocates said current safeguards fail to ensure that the images produced by the machines cannot be misused by TSA employees or other workers. Groups like the American Civil Liberties Union and the Electronic Privacy Information Center contend that the machines are too invasive. 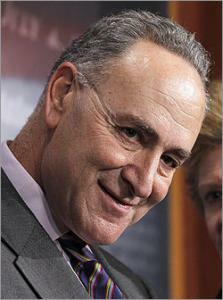 Asked what he thought about use of the scanners, Schumer said he didn’t oppose them. “You need to balance security and privacy,’’ he said. Federal laws prohibit employees of agencies such as the Internal Revenue Service to release private information to anyone not entitled to receive it. No such law applies to TSA scanner images. Although the TSA says its scanners are not equipped to save images, it was recently reported that 35,000 images from a scanner at a Florida courthouse were saved and 100 were posted online. Schumer’s proposed law would make it unlawful to record or distribute an image of any full-body scan taken at an airport, even using personal cameras or hand-held devices.